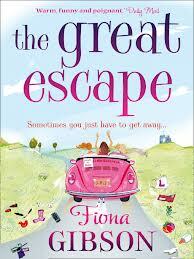 I read my first book by Fiona Gibson only a couple of weeks ago and I loved it and couldn’t wait to read another book by this author, this time I have just finished her book The Great Escape and it doesn’t disappoint. Hannah, Sadie and Lou have been great friends but their lives are pulling them in different directions. Sadie is now living in the country trying to look after her new baby twins and along the way seems to have lost herself among the breast milk and tantrums! Lou is stuck in a dead-end job trying to make end meet while her lazy long term boyfriend is taking her for granted. Hannah is counting down the days to her big day but problems with her step children are causing her to have serious doubts. Will Hannah make it down the aisle? I loved The Great Escape nearly as much as Mum on The Run. The author has such a great writing style which manages to draw you in right from the first page as she throws us straight into a great storyline. The three main characters in this book all have their own individual personalities very different from each other and yet they are all loveable and down to earth characters who I think each reader will find they can relate to one of the characters, for me this was Lou I looked forward to her parts in the book hoping that things were finally improving for her. There is a great mixture of content in this book from affairs to parenting struggles and each of the girls needing to find themselves, so there is something going on on every page so there were no low parts in this book. This book wasn’t humorous or light hearted like the authors previous book it focused more serious problems which ordinary people face in day to day life but the friendship between the girls lighten the tone. I still found myself hooked and I cannot wait for another release from Fiona Gibson.